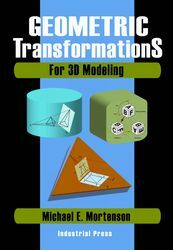 Delivering the theory and application of geometric transformations is the comprehensive mission of Geometric Transformations for 3D Modeling byMichael E Mortenson. The 380 page hardcover volume is the second edition. It provides a thorough introduction. Written from the standpoint of transformation mathematics, the content is accessible by students, teachers and professionals in the field. It is also ideal for practitioners in engineering, math and physics beyond the manufacturing industry.